From April 23rd to 26th, NTK Marine will take part in the new edition of the Antibes Yacht Show that will be held at the Port Vauban of Antibes, the number one marina in Europe. This new edition of the Antibes Yacht Show will be the occasion for NTK Marine to present the new VanDutch models as a start of the season premiere, which are now among the very best manufacturers recognized for the quality of their creations as well as their innovative designs. The latest VanDutch75 model capitalizes on the concepts that made the success of other creations from the brand and notably its straight stem. 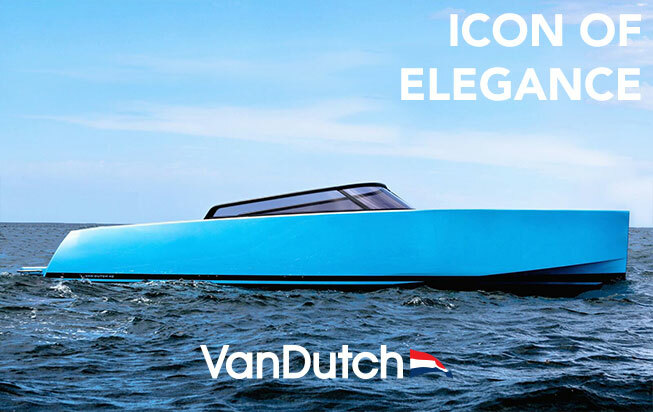 The VanDutch brand has innovated with its day boats with a design signed by Frank Mulder for a demanding clientele sensible to the modern design. Flagship of the fleet, the VanDutch75 is a demonstration of nobility, power and elegance of the Dutch design in luxury yacht tender. The interior layout emphasizes the volume and simplicity with a « contemporary art» atmosphere. Boasting a 2 x 1800 HP, it sails solemnly on any type of sea, opening a unique trail mixing with elegance power and art! The VanDutch Yachts a new vision of luxury tender yachts to discover or rediscover. In fact, far from the preconceived ideas about boating, the luxury yachts tender VanDutch have an easy maintenance thanks to the usage of new materials such as the Esthec, which does not require any maintenance at all and is guaranteed ten years. These luxury boats are also easy to drive which makes them terribly attractive and appreciated. Another major feature for future owners, is the possibility to customize the yachts. During the Antibes Yacht Show, NTK Marine will present its luxury Yachts tender and its services right before the summer. The yachts for sale or rental will benefit from a unique exposure. So from April 23rd to 26th, don’t miss on the exceptional event and come aboard a cruise at the heart of luxury yachts tender.